But attitudes are changing. Rebecca still wants to learn Yiddish, and she’s not alone. 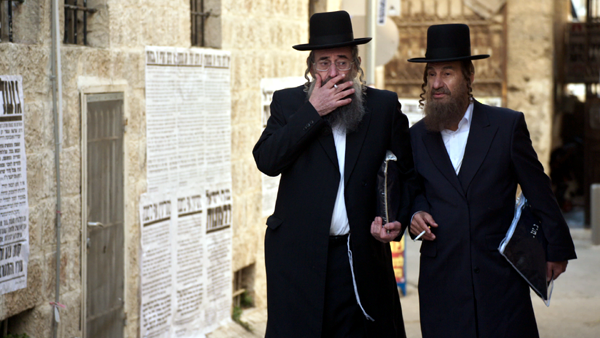 Beginning with the binge-worthy 2013 series, Shtisel, the growing presence of Yiddish in Israeli popular culture reflects a waxing interest in the language among millennials curious about Ashkenazi history and identity. Yiddish is increasingly establishing its own cultural shtetl in the broader Israeli arts scene. 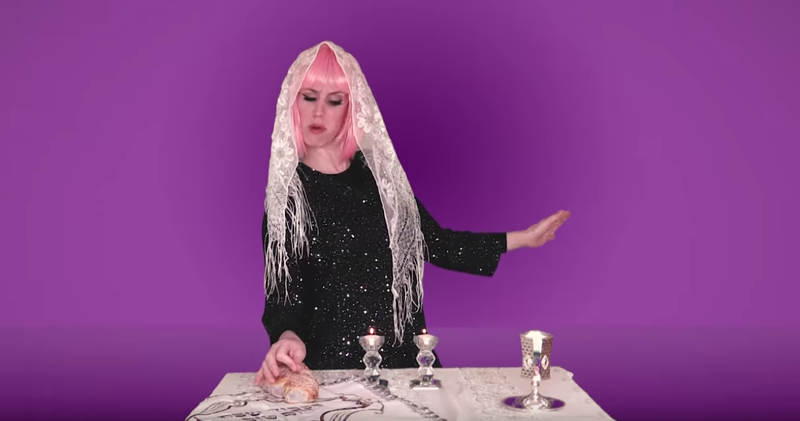 Yiddish was the topic du jour in Tel Aviv earlier this year when Yael Yekel, an actor in Yiddishpiel, Israel’s Yiddish-language theater, made a parody of the Eurovision-winning song, Toy, sung by Israeli pop star Netta Barzilai. A seemingly whimsical piece of Europop, “Toy” is full of Jewish imagery: Barzilai’s chanticleer imitations, coupled with her affectionate use of the word “Kapara", a term of endearment that literally means atonement, conjure the image of a frum Jew anxiously swinging a chicken over his head in the Days of Awe that precede Yom Kippur. The rhymes in Barzilai’s song couldn’t have sounded more Yiddish: boy, toy—oy! Though in English, a vocal riff in the middle of the song plays on the Hebrew phrase, ani lo buba, meaning I am not a doll. The Hebrew word buba is a homophone of the Yiddish word, bube, grandmother. The Jewishness of Barzilai’s Eurovision song was part of the inspiration behind Yekel’s Yiddish parody, Goy, a song that in many ways plays the bube to Toy’s buba—the old Yiddish grandmother chastising the young Israeli girl for forgetting her Jewishness. Yekel’s parody plays on the tension between Ashkenazi Jewish tradition and secular modernity. Yiddish is both the Hasidic dialect of the religious right and the cosmopolitan argot of the Jewish left, and both sides of the language’s modern personality are represented in Yekel’s song: one, the independent Jewish woman who falls in love with a non-Jew; the other, the voice of tradition that says, “Hey, that guy needs a circumcision!” Goy is the fulcrum between religion and secularism. Goy went viral on YouTube and has now been shared and seen hundreds-of-thousands, if not millions, of times. But when Toy was released, Yekel’s ideas for the Kosher Diva were rekindled. Yekel and Goldberg’s first effort was a word-for-word translation of Barzilai’s Toy that preserved the Yiddish-sounding English words Toy and Boy. “The song is really a criticism of the ultra-Orthodox community: it’s all about shirat nashim,” said Yekel, referring to the injunction against listening to a woman sing, a prohibition that goes back to the Talmud, Berakhot 24a. Despite Yekel’s criticism of Israeli religious attitudes towards shirat nashim, the Orthodox position in Israel is perhaps less strict than it is in the United States. The late Sephardi Chief Rabbi of Israel, Ovadia Yosef, famously took rather a liberal position on the ruling against women’s song. Ovadia Yosef, who spent some of his childhood in Cairo, adored the voluptuous tones of Umm Kulthum, and declared it permissible to listen to female voices over the radio, where their faces cannot be seen. 2 2 Elbaz, Vanessa Paloma, ‘Kol B’isha Erva: The Silencing of Jewish Women’s Oral Traditions in Morocco’ in Gray & Sonneveld, Women and Social Change in North Africa: What Counts as Revolutionary, (Cambridge: Cambridge University Press, 2018) 272 More recently, a famous contemporary ultra-Orthodox singer, Narkis, received special dispensation from an Israeli Hasidic rabbi to pursue a career in the pop industry. In Israel, shirat nashim, or kol isha, is one of the areas of Jewish law that may be softening as religious dogma rubs up against liberal modernity. The Israeli ultra-Orthodox singer Narkis performs her song “Fields” live on the Radio Galgalatz channel. I asked Yekel what reaction she’d received from the ultra-Orthodox community. Yekel’s harsh stance is fairly typical. In Israel, the tension between religion and the state is visible in the socio-economic gaps that divide ultra-Orthodox Jews and secular Israelis. The distance between the religious Jerusalem neighborhood of Geula and Ha’aretz-reading north Tel Aviv may be a matter of kilometers, but culturally they are as far apart as Tallahassee and Tehran. Yekel’s interaction with the ultra-Orthodox community wasn’t all negative, however. Not long after Goy was released, Yekel was contacted by a datlashit, an ex-Hasidic girl who was serving as a Lone Soldier in the Israeli army. She told Yekel what a hit she was among her ex-religious friends. Most Yiddish-speakers in Israel are ultra-Orthodox, and young people who leave the community, estimated at 6% of the total ultra-Orthodox demographic, are probably among those best placed to appreciate pop culture in Yiddish. Nevertheless, Yekel’s song has done a lot for the status of Yiddish among secular Israelis. While Yiddish revivalism outside ultra-Orthodox spaces is often framed as leftist, a celebration of Jewish cosmopolitanism in contradistinction to Hebrew-speaking Zionist nationalism, young Israelis, estranged from religion, seem to be looking to the languages and aesthetics of their past to craft secular identities in the present. Honoring the Jews’ European past is perhaps one of the reasons why Yekel’s parody of this year’s Israeli Eurovision entry is merely one in a growing list of Israeli-penned Yiddish versions of Eurovision songs. The 1988 Israeli entry, “Ben Adam” by Yardena Arazi was translated and improved a few years ago by Yoni Eilat. Yardena Arazi performs “Ben-Adam,” the 1998 Israeli Eurovision entry. Yoni Eilat’s rendition of the 1998 Israeli Eurovision entry. Likewise, the Israeli klezmer group, Trio Carpion, produced a version of Israel’s 2007 Eurovision song, “Push the Button” by the Teapacks. “Eurovision is very campy,” she said, “And I think a lot of gay people are drawn to Yiddish. I asked Yekel if she believed in the much-discussed renaissance of Yiddish. “I don’t think Yiddish is going to get super popular. What I do hope is that people won’t neglect it. Even if it’s just a small group, I hope people will hold onto it. It’s fun for me to hear that they teach it in schools. There’s even a bagrut in Yiddish,” she said, referring to the Israeli high-school graduation exam. Around ten years ago, Misrad ha-Hinukh, the Israeli education ministry, decided to make Yiddish available as a third language to high-school students. This year, education minister, Naftali Bennett, gave permission for Yiddish to replace English as a second language, paving the way for religious schools to receive more government funding for educational projects in the language. About five-hundred students a year take a high-school graduation exam in Yiddish. Some 70% of those students are women, which suggests that the Yiddish high-school exam is more popular in religious schools than in secular ones. Eyal Iflah, a Mizrahi Jew who works at an electrical store in Tel Aviv, was one of those who studied Yiddish in high school. Eyal didn’t pursue Yiddish after high school, but he’s heard of the Yiddish theater, and he’s sanguine about the future of the language. Most Israelis unwittingly encounter Yiddish on a daily basis. In the Jewish state, the dusty bones of Yiddish lie beneath the often thin derma of the Hebrew language: they are in the erasure of alephs and ayins in the Tel Aviv street signs that bear the names of famous writers, in the Yiddish words that have been bent and stretched to fit the Semitic paradigms of Hebrew grammar—lefargen, from farginen, or lehaflik from flikn—they are in the nu-nus of cantankerous drivers hurrying passengers onto the buses. Yekel’s song moves in the opposite direction. In her Yiddish parody of Toy, she brings the Yiddish background to the foreground, uncovering the Yiddishkeit beneath the palimpsest of modern Israel. I met with Mendy Cahan, director of Yung Yiddish, to discuss power and parody in Yiddish. We sat in the behind-the-scenes office space of his Yiddish library, located at the western edge of the fifth floor of Tel Aviv’s labyrinthine tahana merkazit, the second largest bus station in the world. Continually rattling under the weight of buses coming and going from the Egged depot on the sixth floor, Cahan’s library boasts a bar, a pond, a stage, and a collection of 40,000 books and periodicals in Yiddish. With his characteristic bushy eyebrows and wild, mad-professor hair, Cahan looked nostalgic as he told me about the time he met with the Yiddish translator Mordechai Litvine in Paris in the late-1980s. He leaned back in his chair, rolled a cigarette, struck a match, and inhaled a deep breath of smoke. “There’s a really old tradition of translation into Yiddish—the idea of fartaytsht un farbesert, translated and improved,” he began. He spoke about Schiller’s poem, Das Lied von der Glocke, one of the longest and most famous poems in the history of German literature. “The poem describes how a bell is made—the heating of the furnace, the melting of alloy, the wax mold, the casting process. “In the mid-nineteenth century, the Yiddish poet Avraham Gottlober made a parody of the poem, Dos lid funem kugel,” said Cahan, “Schiller begins by describing the clay pit that will host molten metal; Gottlober also begins with the image of clay—the clay of the pot that will receive the noodles. If Judaism is an experience of Otherness, perhaps Israeli popular culture in Yiddish somehow retrieves the sense of foreignness that defines so much of Jewish history. At the end of our interview at Café Nahat, I asked Yael Yekel whether she’d met Netta Barzilai, and what the pop diva thought of her Yiddish parody. Blitz, Avi. “Translated and Improved: Yiddish Pop Culture in Israel.” In geveb, November 2018: https://ingeveb.org/blog/translated-and-improved-yiddish-pop-culture-in-israel. Blitz, Avi. “Translated and Improved: Yiddish Pop Culture in Israel.” In geveb (November 2018): Accessed Apr 22, 2019.